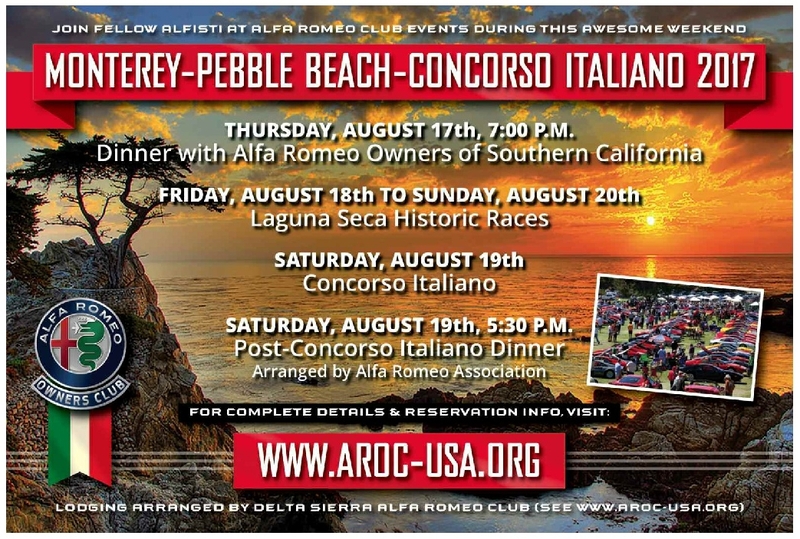 August 17 (Saturday) – AROC National – AROC Goes to Concorso Italiano, Black Horse Country Club, Monterey (CA). Come visit us our our booth! Contact Cindy Banzer at c.banzer@aroc-usa.org or Doug Zaitz at d.zaitz@aroc-usa.org or 509-768-4312. Welcome to joining fellow AROC-USA and ARA Alfisti at the 2019 Concorso Italiano. AROC and ARA will be welcoming all visitors at our booth at CI on Saturday, August 17th. Please note that Delta-Sierra ARC is handling lodging (while rooms last). Concorso Italiano will be held at the prestigious Black Horse Golf Course in Seaside (CA), 9:30 a.m. to 5 p.m. For more information and tickets, visit the CI website at www.concorso.com or call 425-742-0632. Please enter Concorso Italiano vehicles directly at www.concorso.com.